I had an encounter with this buck the previous Saturday, October 5, 2013. I was sitting 40 yards off a creek in a pinch point, and about 5 o'clock I heard splashing in the creek. Sounded like a dog swimming in the creek. I looked over my shoulder and this guy was cruising down the creek with the current down around the bend and out of sight. I sat there and thought how awesome a sighting that was, and also felt disappointed he had just bypassed my pinch-point heading towards the corn. So the night of October 11th I had the NE wind I needed and slipped in, adjusting my stand a quarter mile down the creek in a funnel. Sitting in the timber with the corn 40 yards in front of me, and the creek 60 yards behind me, I had set up over a nasty fresh rub line with six or seven fresh scrapes in a 100 yard stretch. About 5 o'clock I tickled the rattle bag and grunted a few times very lightly. Around 6 o'clock the wind died to nothing, and it cooled down quite a bit. Enough for me to reach for my jacket. I got that feeling like the hairs were standing up on the back of my neck, something's going to happen tonight! I grabbed the grunt tube and let out a few light notes. A couple minutes later I heard foot steps in the creek behind me. I couldn't see anything yet, and questioned whether I had even heard it! Five minutes later, I heard him crunching behind me, dead down wind, and the buck proceeded to make a scrape. I shot him while he was freshening up that scrape. I knew I had ranged that tree when I climbed up at 30 yards on the dot for a reason... he staggered 30 yards and dropped. I hit him quartering away with a high back lung entrance and low heart exit. Best hunt and deer of my career thus far! 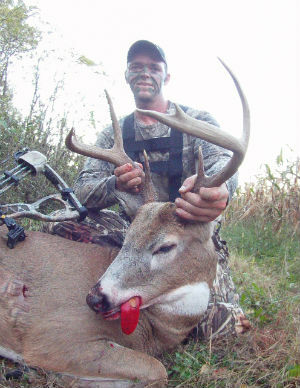 The buck was harvested on public land in Genesee County with a Hoyt Charger, Carbon Express Maxima Hunter arrow, and Shwacker broadheads. He dressed out at 193 pounds.